Best Dog tracking device, What is Dog tracking device? What Is Dog Tracking Device? The dog tracking device has a built-in terminal of the GPS module and the mobile communication module and is used for transmitting the positioning data obtained by the GPS module to a server on the Internet through the mobile communication module (gsm/GPRS network), thereby realizing the computer or the mobile phone. Query the terminal location. In view of the frequent occurrence of pet loss, dog tracking device came into being, and it has its place. What is the Dog tracking device look like? Small size, suitable for dog tracking, long working time. The tracking device on below photo is PT21 device, it has very small size, and lightweight which will not cause pressure for dogs, also we can set different time interval for it, under extreme power saving model, PT21 tracking device can work around 15days, if set time interval as 60 minutes, it can work for around 7 days. For dog tracking we can add one collar, please check below photo. （1）4ways to get location: GPS + Beidou + LBS + WIFI What are the functions of Dog tracking device support? LBS base station positioning + GPS satellite positioning, continuous positioning by GPS, when GPS cannot be covered, will be located through LBS, GPRS upload data to the server, also if there is wifi signal around a tracking device, it will get location information via wifi signal. 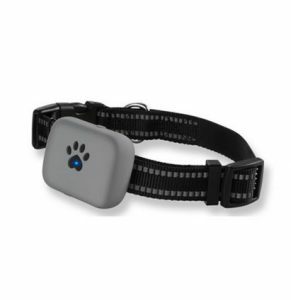 The dog tracking device has a vibration function, and the pet is very sensitive to vibration. This function can be used to train pets, improve bad behaviors such as chaos and runaway, and cultivate good habits. Set the safe range of pet activities, out of the safe range, dog tracking device mobile APP will receive an alarm message. Check out the pet’s historical footprint and clearly understand the whereabouts of your pet. When the pet leaves the set security range, the dog tracking device is low-powered, or the device is offline, the mobile APP will receive an alarm message to keep track of the running status of the device. How to use dog tracking device? 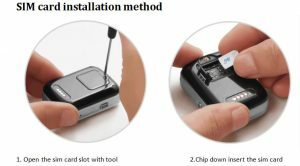 Open the SIM card slot of the dog tracking device and insert a Micro SIM card. The sim card we use should support send/receive SMS function, caller ID Display, and GPRS Service. After installing sim card Press and hold the power button for 2 seconds, the dog tracking device vibrates, the indicator light is on, and the boot is successful. 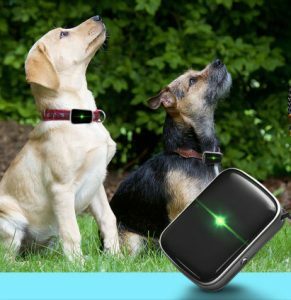 After booting up, insert the tracking device with the collar, adjust the collar button according to the size of the pet’s neck, and wear it to the pet. Use the mobile browser to scan the specified QR code as below to download the APP and install it, enter the IMEI code to remotely control the dog tracking device.